Meet Peg Berens, founder and principal of Peg Berens Interior Design LLC. An award-winning interior designer with a studio in Orange County, Peg recently designed new interiors for her own home and called on Hammerton to assist. Nestled on a one-acre ranch in an equestrian community in Orange County, Peg's house has the look of an east coast traditional estate. Her interiors embody a warm yet fresh style by thoughtfully combining traditional and eclectic design elements. Her motto: "To use common materials in unexpected ways and unexpected materials in common ways." When it comes to lighting, Peg places particular importance on thoughtful consideration of fixture design, materials and integration with interior spaces. "Lighting is one of the most important design elements," Peg explains. "People underestimate its value, but lighting is a major design element that can pull together the overall aesthetic of a home." While it's often viewed as the 'finishing touch' of a home, Peg believes that lighting decisions should never be left until last. 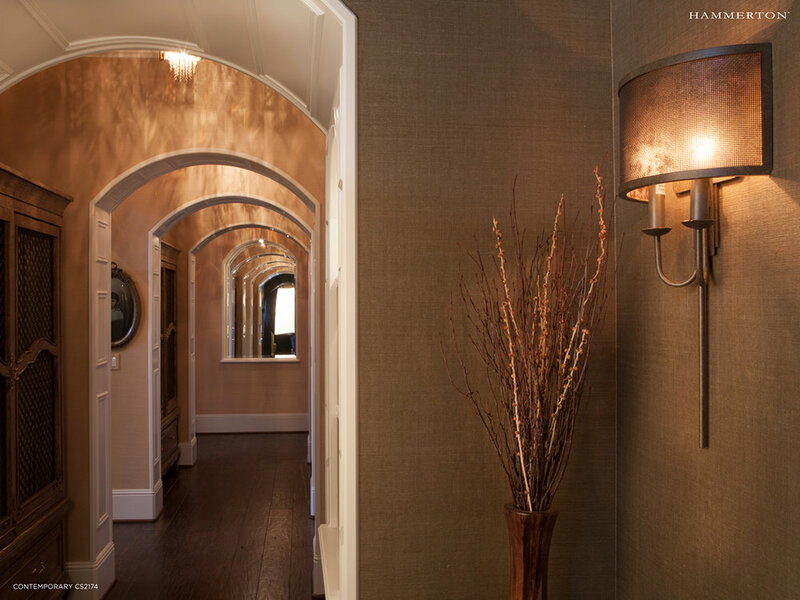 There's an important psychology wrapped around lighting and the layering of light, she explains, which is why lighting should be included in the initial planning phases of a residential design project. "It's easy to tell when lighting decisions are left to the last minute, as it diminishes the impact of the overall design," she says. Peg emphasizes that her lighting choices were instrumental to achieving an aesthetic balance between 'classic' and 'current' in her home. She selected fixtures from the Hammerton Contemporary and Chateau Redux collections that featured traditional forms and shapes updated with clean lines and unusual materials like woven steel mesh and crystal beads. — Peg Berens, Founder, Peg Berens Interior Design LLC.